A must-have. 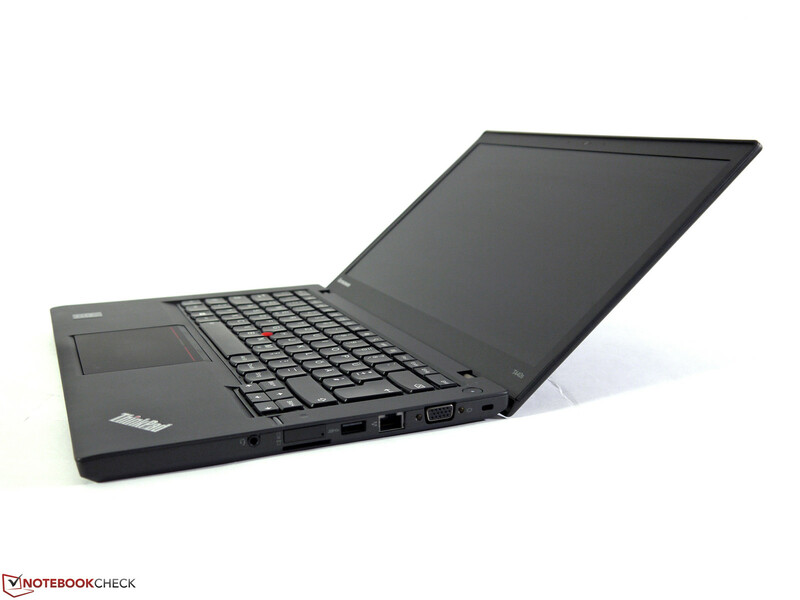 The T440s is currently one of the most sought-after products on the mobile business market. But with so many versions available, it is not exactly easy for a buyer to figure out which model is best suited to his or her individual needs. To follow-up on our review of the basic version, here we have written an update reviewing the top model, equipped with an Intel i7 CPU, FHD IPS display and a fat 9-cell battery. About three months ago, we put the 20AQ-S00500 version of the Lenovo ThinkPad T440s (i5-4200U, 4GB RAM, HD+-Display, 500 GB HDD) through our comprehensive battery of tests. Even this basic configuration received an overall score of 88% -- a "very good" overall result. The price of this basic configuration? Around 1300 Euros (~$1760). However, the T440s can do quite a bit more, at least according to the alternative models' data sheets. A Full HD IPS display is likely near the tip-top of a ThinkPad user's wish list -- a feature that adds a lot of value to the notebook, especially compared to the HD+ display on the model we previously reviewed. In terms of performance, you can expect a slight increase in performance power from the Intel i7-4600U, but it is the 256 GB SSD that will certainly provide a substantial boost for daily tasks. The SSD is now the primary storage option and makes working with data quick and easy. 8 GB vs. 4 GB of working memory is more like icing on the cake than anything, though some particular applications will do quite well with the extra memory. For mobility-junkies, we also reviewed the alternative 6-cell battery with a capacity of 72 Wh, which together with the permanently integrated 23.5 Wh battery provides a whopping 95 Wh of electric energy. This is the largest possible battery configuration. Because there are no differences in appearance between the various models (except the battery), some of our images come from our previous review. 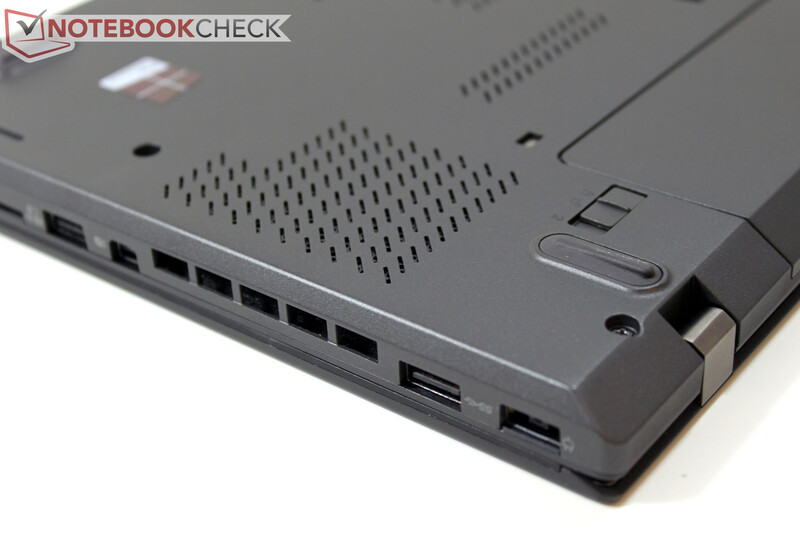 Please also refer to our review of the basic configuration of the Lenovo ThinkPad T440s for information regarding its case, connectivity and input devices. 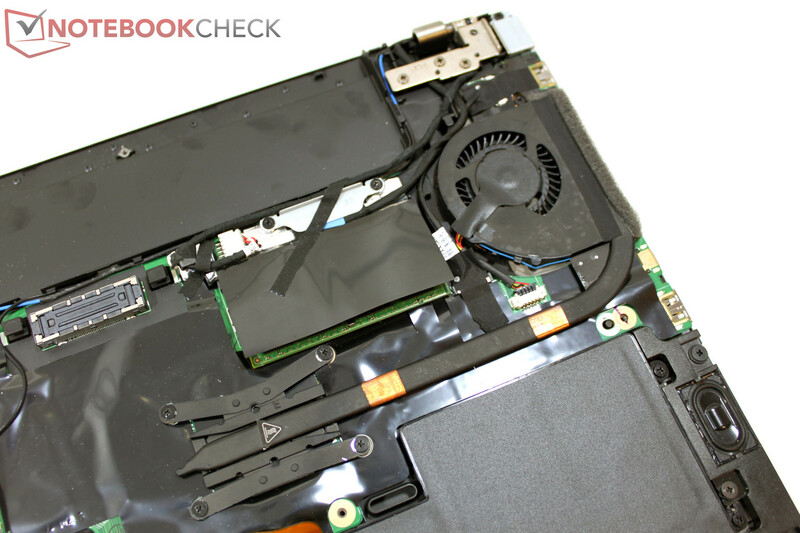 Using Lenovo's Hardware Maintenance Guide, we looked under the Lenovo notebook's skin. Even though it lacks a maintenance hatch, with the help of a screwdriver the case can be easily opened and the inner components exposed. This gives the user access to the fan (including the cooling element), a RAM slot, the integrated battery, the 2.5-inch SSD drive, the WWAN and WLAN modules, and the BIOS battery. Switching out the SSD drive would be a simple process. Our test device is equipped with a 7mm model from Samsung, but conventional 9mm drives would also fit in the slot. However, it is not possible to upgrade the system with a conventional mSATA drive, as the WWAN module uses an incompatible new M.2 connector here. 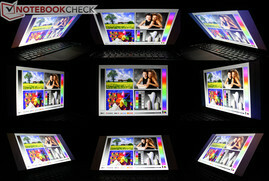 Lenovo offers three variations on their display: An HD+ panel with a matte screen and a resolution of 1600x900 pixels, based on TN technology (see review); a matte FHD display with a resolution of 1920x1080 pixels and IPS technology (which we will cover extensively in this section); and a panel with the same basic features, but with integrated touch technology. We will begin with the display brightness measurements. In the center portion of the screen, we measured a maximum brightness of 310 cd/m². 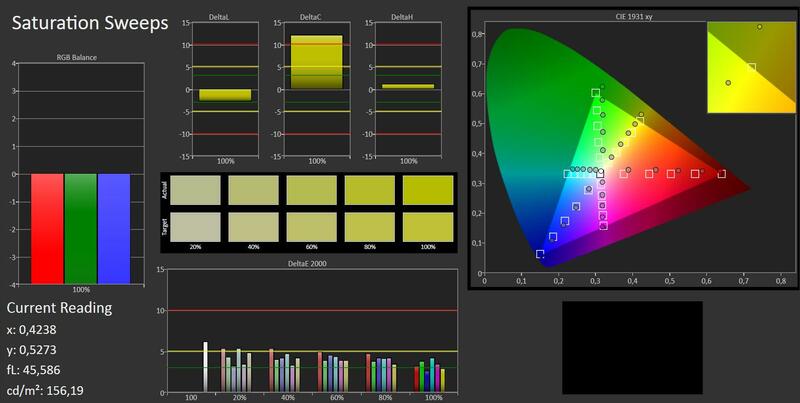 Especially in the corners, the screen grows a little dimmer, pulling the average brightness level down to 282 cd/m². If you switch the screen to a completely black background and look closely at the display in a dark room, you will notice some screen bleeding along the right edge of the panel. This had no discernible negative impact on the display image during everyday use, however. 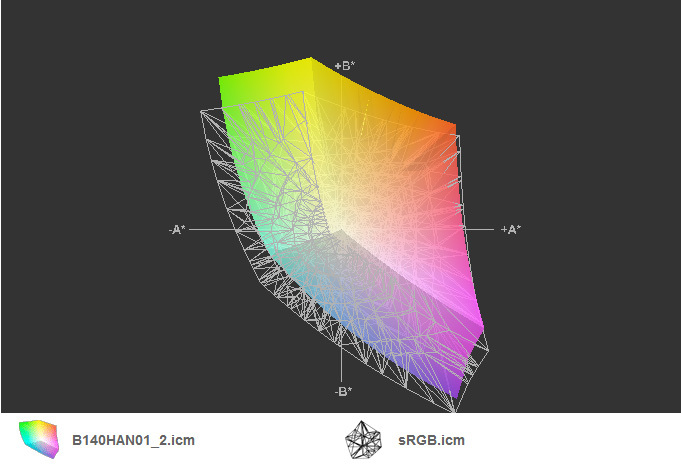 At 0.38 cd/m², the black value is small enough to create a rich contrast ratio of 816:1. At the proper setting in the energy-saving profile, even in battery mode, the full display brightness is available. Straight out of the factory, with our photo-spectrometer we measured DeltaE(2000) deviations of 5.12 in the grayscale and 4.56 in ColorChecker. These are good numbers overall -- only just beyond the target area of 3-5. 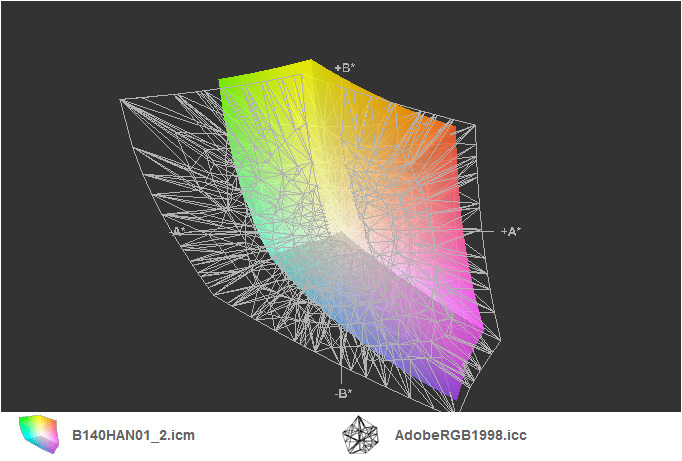 But the display's true qualities are only apparent after a calibration with our i1 Pro 2. Looking at the measurements from the calibrated display, the DeltaE values sink substantially. (The DeltaE values represent the deviation of the displayed colors from the sRGB target color space.) 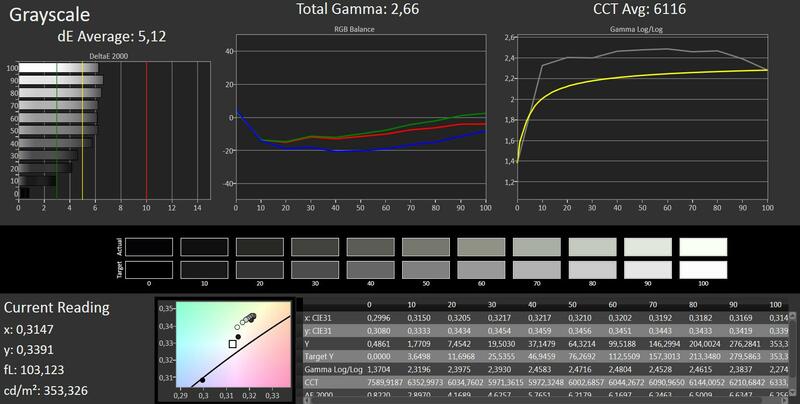 After calibration, we record average DeltaE deviations of no more than 1.76 in ColorChecker and 1.01 in the grayscale. Even for a trained eye, it would be practically impossible to distinguish between these colors and the sRGB color palette. Post-calibration, the average color temperature is raised from a somewhat too warm 6116 degrees Kelvin to an almost optimal 6473 K.
Not only in the world of numbers does the panel do its job well -- in practical use, we were also very pleased with the screen and its rich, sharp display. The display image on the IPS panel is always clearly legible, even from unfavorable viewing angles. Also, thanks to the display's matte surface, the user is spared the aggravation of fighting against reflections from outside light sources. 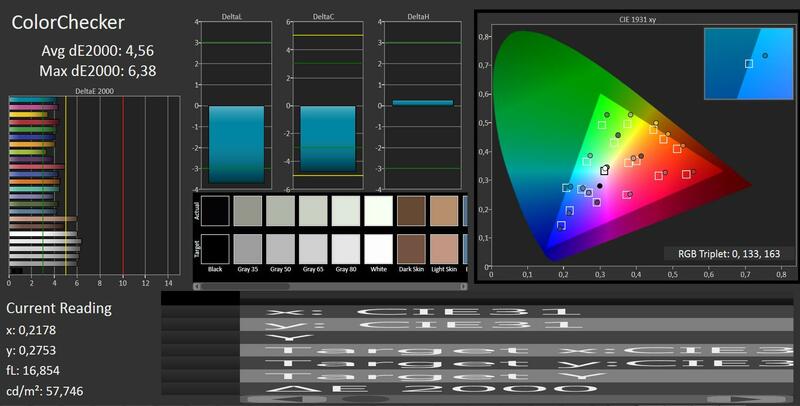 Compared with the alternative HD+ display, the FHD panel is clearly the preferred option. With its accurate colors, better viewing angle stability and considerably higher contrast, the user can enjoy a substantially superior display image. Not to mention the fact that the high (but not uncomfortably high) resolution generates extra desktop space. A price difference of about 450 Euros (~$610) separates the basic model with an Intel Core i5-4200U, 4 GB of RAM and an HDD from our high-end review device with an Intel i7-4600U, 8 GB of RAM and a 256 GB SSD. Other in-between models are available too -- in specific configurations. Lenovo also enumerates a version of their device with an Nvidia GT 730M. However, in exchange for the graphics unit the user has to make do without a docking port, as the board is organized very differently and no space remains on the underside of the device for the necessary connector. 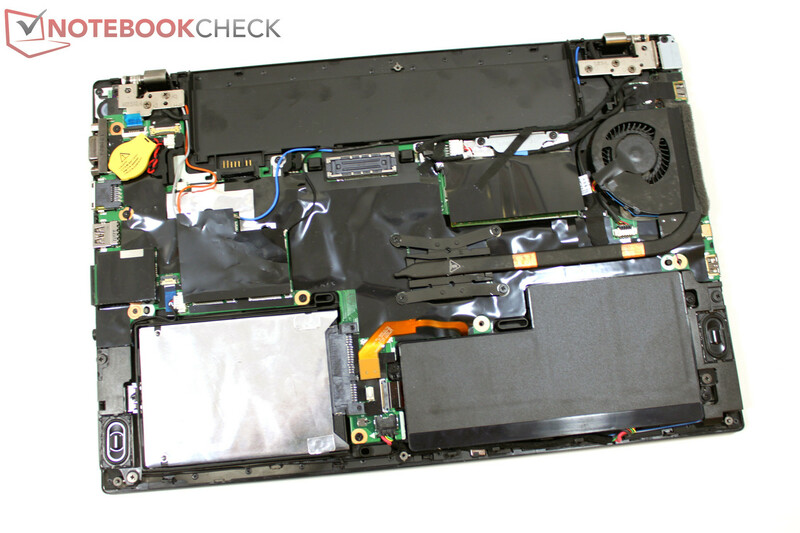 Lenovo offers three distinct chips for their ThinkPad T440s. The basic version is equipped with the familiar Intel i5-4200U -- a CPU encountered in many of today's notebooks. The alternative i5-4300U, found in the mid-level Lenovo device, is less common and used by the manufacturer in conjunction with the GT 730M GPU. Because the CPU and GPU's clock rates are somewhat higher, this chip promises slightly stronger performance than the basic model's CPU. Last but not least is Intel's i7-4600U. This chip is at work in many high-end ultrabooks. With clock rates of 2.1 to 3.3 GHz, the user can expect a noticeable increase in performance compared to the basic processor configuration -- as long as the turbo runs with endurance, of course. Let us look at this in more detail. In the Cinebench R11.5 single CPU rendering test, after starting, the chip accelerates to 3.2 GHz for seconds at a time. However, for the most part, the CPU runs at 3.0 GHz -- a speed it holds all the way to the end of the test. 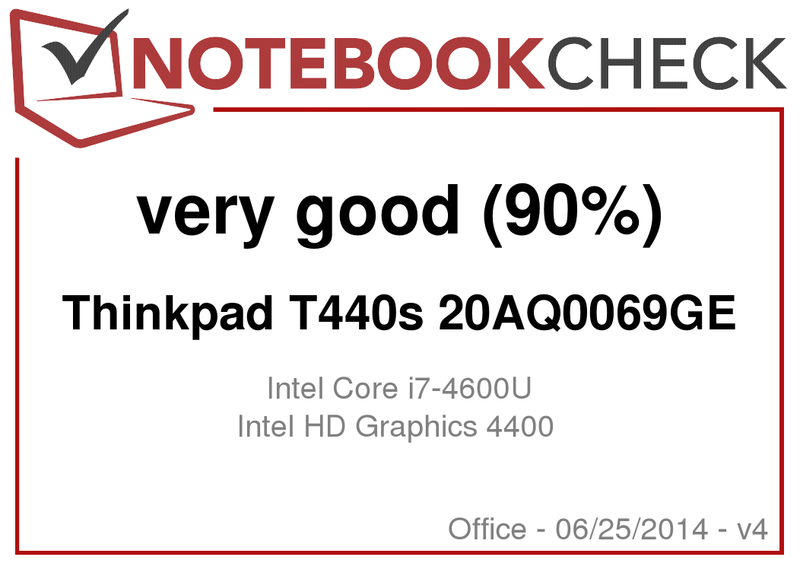 At a score of 1.42 points, the T440s comes in ahead of most of the other devices in our database in this test, just behind the recently reviewed ThinkPad X240 (which runs on the same CPU). The i7 version's lead on the i5-4200U model here is clear: The Lenovo notebook with the i7-4600U does about 25% better than the T440's i5 configuration we recently reviewed. And where does the alternative i5-4300U stand? We just tested the chip in the recently released Dell Latitude E7440, and the i7-4600U achieves a 10-15% higher result here. Our review device's score in the multithread test is also very good. The T400s comes in ahead of the similarly equipped X240 and the i5 T440s lags behind by about 10%. In the first few seconds of the test, HWInfo showed a maximum clock rate of 3.0 GHz, then after about 10 seconds, it fell back to 2.4 to 2.5 GHz. 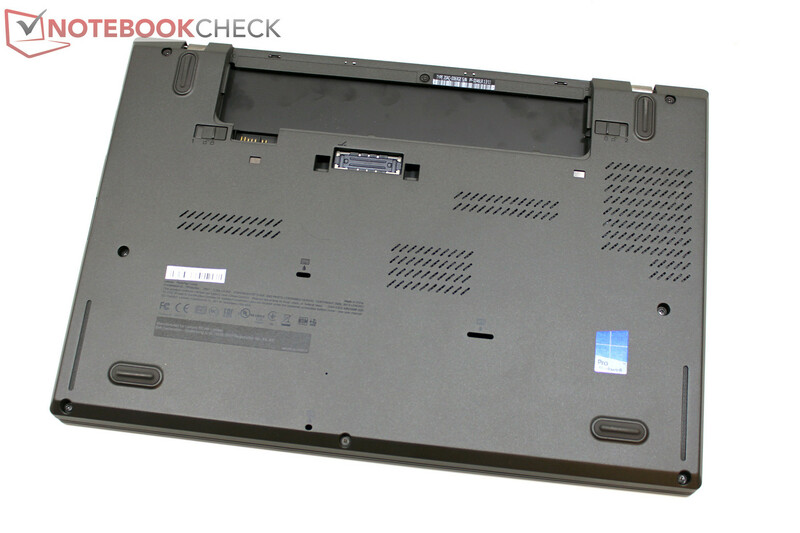 With the i5-4300U, the Dell Latitude E7440's result is almost identical. In the Cinebench shading test, for the first few seconds the GPU's maximum frequency reached 1100 MHz, while it leveled off to between 800-1000 MHz during the remainder of the test. But the advantage of our i7 version is still clear: It achieves a 37% higher result than the model with the i5-4200U we tested, even though both have the same Intel HD 4400 graphics solution (though it clocks slower in the i5 version). 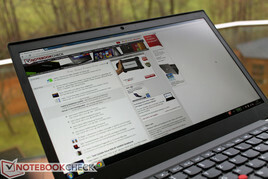 In the same test, Intel's i5-4300U comes in about 6% behind in the Dell Latitude E7440. Even though the chip only approaches its theoretical maximum turbo clock rates for short periods, compared to the basic T440s model, the results are promising. Users who could profit from more CPU power will probably find what they need in the i5-4300U or the i7-4600U chips. The T440s' full CPU and GPU performance is still available in battery mode. The results from the benchmarks we ran in battery mode only differed negligibly from the results in AC power mode. 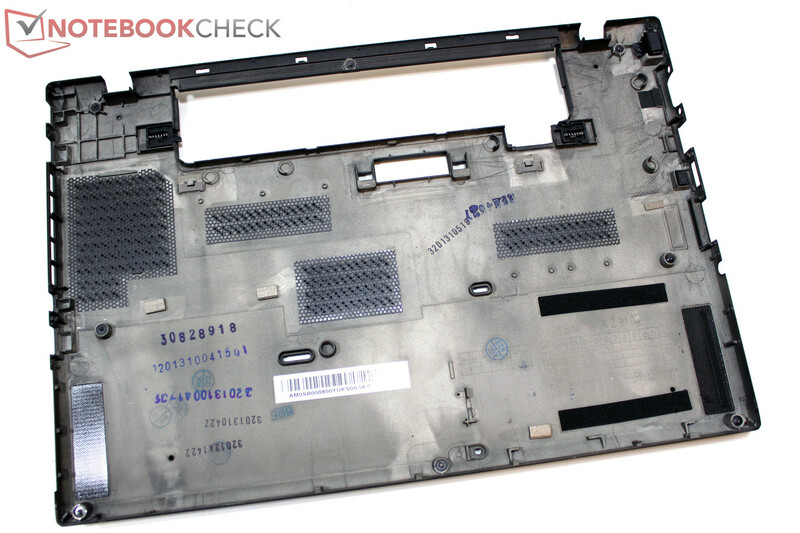 In PCMark 7, our test device reaches a great score of 5022 points. The similarly outfitted ThinkPad X240 falls behind by about 13%, while Dell's Latitude E7440 with the i5-4300U CPU lags behind by about 10%. The enormous difference between the i5 version of the ThinkPad T440s we tested and the i7 model is less related to the CPU and more related to the mass storage device. The i5 configuration is equipped with a conventional hard disk, and this particular benchmark mercilessly penalizes systems that lack an SSD. The slow responses we sometimes experienced when opening files and programs with the i5 T440s is history with the i7 device's SSD. The i7 system always responds to input and commands immediately. The system boots from cold within about 15 seconds and from standby the system stands at the ready in a fraction of a second. Lenovo outfits their ThinkPad T440s with a 2.5-inch slot that houses either a conventional HDD or an SSD, depending on the model. Drives with a thickness of up to 9 millimeters should fit in this slot. In their product specifications, Lenovo also mentions a 16 GB mSATA SSD cache that can be combined with an HDD. Upon closer look, we see that this is related to a new M.2 slot on the board. In our test device, the slot is occupied by the WWAN module. Normal mSATA or mini-PCI Express cards are not compatible with this slot. Unfortunately, we lacked the hardware necessary to test the connection's function in cooperation with an alternative M.2 SSD. This should not be a concern for most users, as the 2.5-inch slot provides more than enough space for SSDs of all kinds. Out of the factory, our test device is equipped with a drive from Samsung (MZ7TD2560/0L9) with a thickness of 7 millimeters and a gross capacity of 256 GB. Some bundles offer smaller SSDs as well. 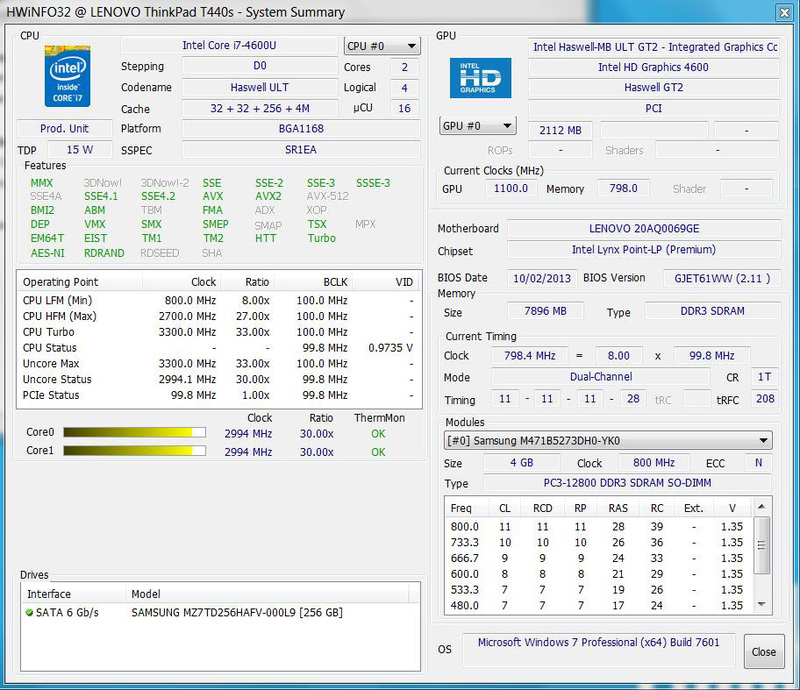 In the CrystalDiskMark test, our test notebook achieves a good result of 507 MB/s. In the write test, on the other hand, the device only reaches about 260 MB/s. 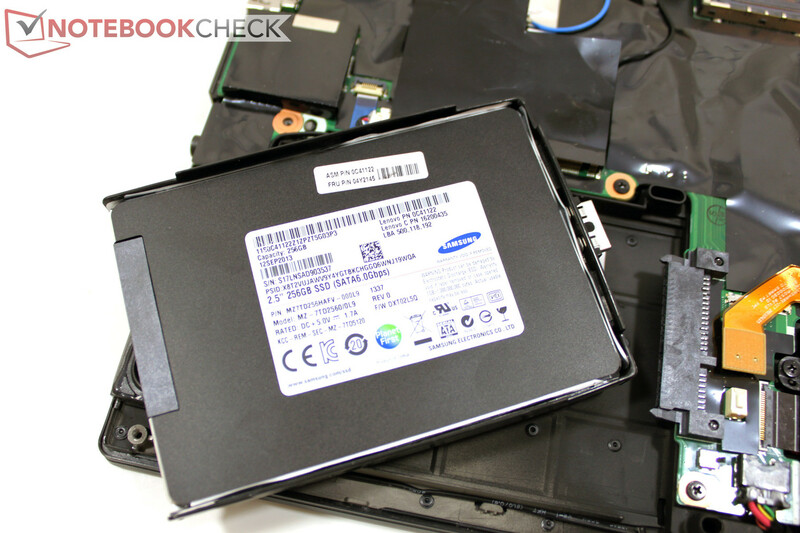 We observed the same behavior with the Samsung 840 SSD. Some current high-end SSDs can work considerably faster here -- for instance, Samsung's 840 Pro or OCZ's Vertex/Vector. The storage medium is well prepared to transfer small blocks of data, however. In the 64k test, the drive reaches a good 28.26 MB/s in the read test and 73.62 MB/s in the write test. With those speeds, the storage device is near the top of the game amongst current top-class SSDs. The Intel HD Graphics 4400 integrated into the CPU package is primarily designed for use in the office environment, and represents the most common CPU-efficient decoder for video playback. 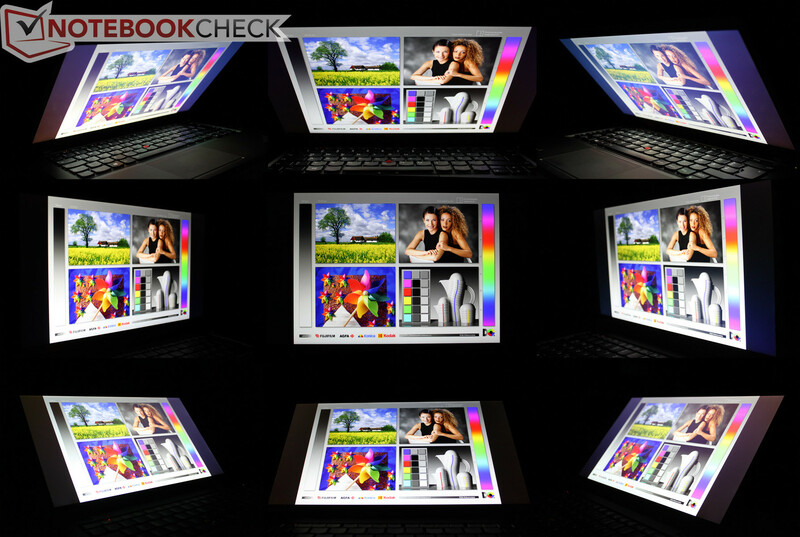 In the i7-4600U installed in our test device, the HD Graphics 4400 has a clock rate of up to 1100 MHz -- a number the notebook repeatedly reached in our test. In 3DMark 2011, the solution installed in our review device falls within the top third of all notebooks we have tested with Intel's HD Graphics 4400. Dell's E7440 with its i5-4200U lags about 18% behind here. The version of the T440s with the i5-4200 CPU also falls behind by about 15% here and is essentially tied with the ThinkPad X240 (i7-4600U, -16%). Equipped with a 4500U CPU, Toshiba's Portege Z30 achieves the best result in this test, with a lead of about 9%. Still, just to get a better feel for the integrated GPU's performance: Nvidia's middle-class GT 540M GPU from the year 2011 is more or less on par with our test notebook's GPU. How helpful would Nvidia's GT 730M be here? In the same benchmark, the notebooks we have tested with this GPU have achieved results around 100 to 125% higher than notebooks with Intel's HD Graphics 4400. We would expect the GPU's performance reserves at least to double, much like in the Acer Aspire 581PTG, unless Lenovo limits the GPU's maximum clock rates in order to regulate the device's temperature. Is the GPU's improved performance in the benchmarks we have covered thus far available for games as well? We tested out the racing game F1 2012 once again, as we did on the i5 version of the T440s. At the game's lowest and medium graphics settings, it runs fluidly, just as it did before, though its graphics performance is slightly improved. But this improvement is far from sufficient for higher graphics settings. The T440s can run older games at lower settings and/or browser games, but unfortunately, the lineup ends there. Here too, only a version of the T440s with the GT 730M graphics chip could provide a substantial increase in graphics performance. We were already pleasantly surprised with how quietly the i5 T440s model went about its business, even with its conventional HDD. With the mechanical mass storage device gone, the notebook is even quieter -- so quiet, in fact, that we would describe it as silent in idle mode and under low levels of load. By automatically reducing its clock frequency when the tasks at hand demand little in the way of performance, the CPU can keep its core temperature at 40-50 °C (104-122 °F) even with the fan deactivated. Only when the performance demands spike repeatedly does the fan turn on. But on its lowest setting, even the fan is barely audible. Under mixed load (3DMark 2006), the fan rotates constantly and reaches a sound pressure level of 32.9 dB(A). During the stress test, the device's volume only increases minimally: 33.4 dB(A). Even when it is under load for an extended period, the notebook is still quiet enough to go unnoticed -- all you hear is a soft background noise. The i5 version was a little louder under load, but the HDD's audible whirring was responsible for most of its noise, even in idle mode. All told, the lower noise emissions are a point in favor of our i7 review device. 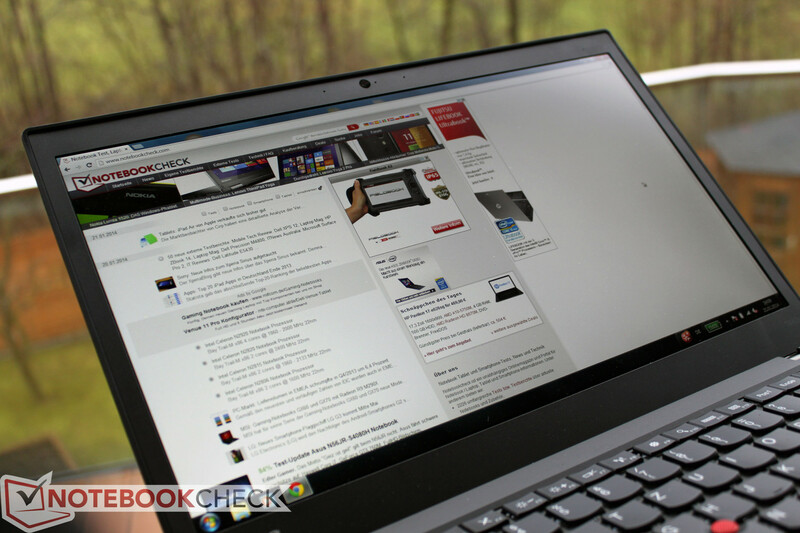 Overall, our Lenovo ThinkPad T440s remains at cool to comfortable temperatures in all of our test scenarios. The temperatures we recorded in the stress test were somewhat higher than those produced by the i5 version, but at peaks of no more than 37 °C (98.6 °F); in no area does the case grow problematically warm. Even lap use should be possible under all levels of load, though the user ought to be careful not to obstruct the ventilation holes on the left portion of the underside of the device. The fan pulls the bulk of its cooling air through these holes. During our normal stress test, with the CPU and GPU under full load in parallel, the T440s immediately reduced the CPU clock frequency to between 800-1000 MHz. The chip temperatures remained uncritical -- under 70 °C (158 °F). The GPU clock frequency leveled off at between 650 and 700 MHz. When we used Prime95 to stress only the CPU, it started at 3.0 GHz and after a few seconds dropped down to 2.1 to 2.3 GHz. The CPU temperature did not exceed 80 °C (176 °F) here either. The GPU ran FurMark alone for several seconds at its full clock frequency (1000 to 1100 MHz) and then fell back to 700-800 MHz. Compared to the i5 version of the T440s, Lenovo made a number of changes to the i7 model that are crucial for the notebook's energy consumption levels -- especially when it comes to hardware. Under load, the i7 CPU runs at a considerably higher clock rate and burns more energy than the i5 chip -- but it also finishes the required computations more quickly and returns to an energy-saving sleep mode sooner. The SSD should also save more power than the HDD in the basic T440s device, while the bright FDH IPS display could prove to be more of an energy guzzler. We measured the i7 version of the T440s' energy consumption rates under various levels of load. In idle mode, we recorded a power draw of 3.4 to 8.5 Watts. The i5 model we previously reviewed consumed 4.1 to 8.7 Watts here, which could mean that the our i7 test device has a slight advantage in idle mode, as long as we work under the assumption that these measurements are strictly and reproducibly accurate. Under load (mixed, 3DM06 Median), the two devices are nearly on par with each other once again. The stress test is the first place the i7-4600U pulls ahead for a moment and reaches a maximum energy consumption level of over 40 Watts. At 45 Watts, the power supply Lenovo includes in the i7 version's packaging can barely supply enough juice to satisfy the notebook's energy demands under maximum load, but for everyday use, it is certainly large enough. 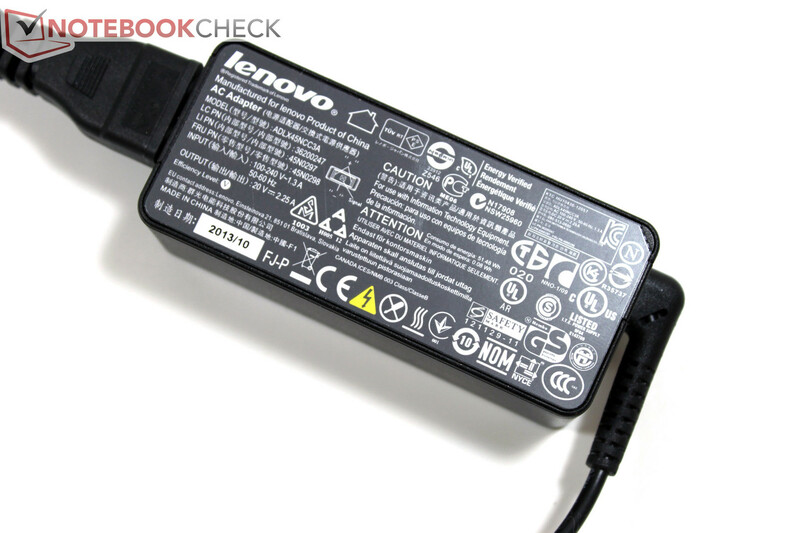 Obviously, Lenovo chose a different power supply model for their i7 device than for the i5 version we previously reviewed, as the i5's power supply had a power rating of 60 Watts. ...it can also more than double the T440s' battery run times. 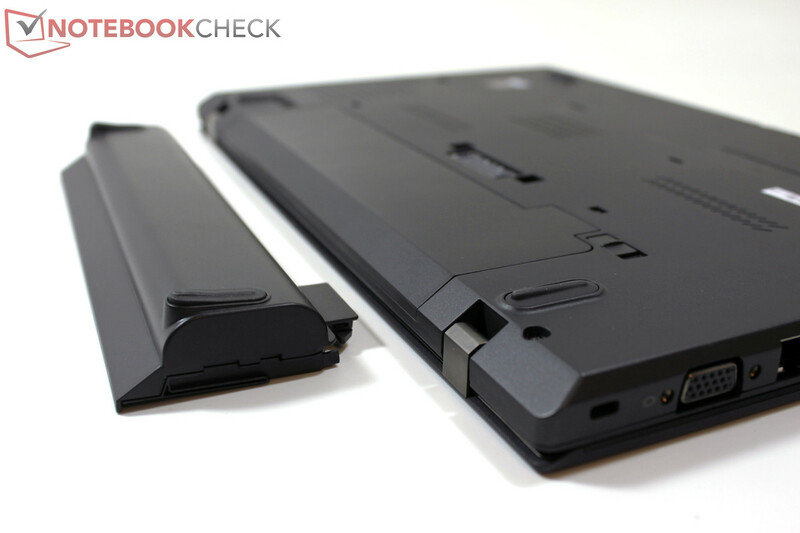 Lenovo offers two possible battery configurations for their ThinkPad T440s. The basic option is two 24 Wh batteries, one of which is integrated into the case and cannot be removed. Our test device represents the other option. 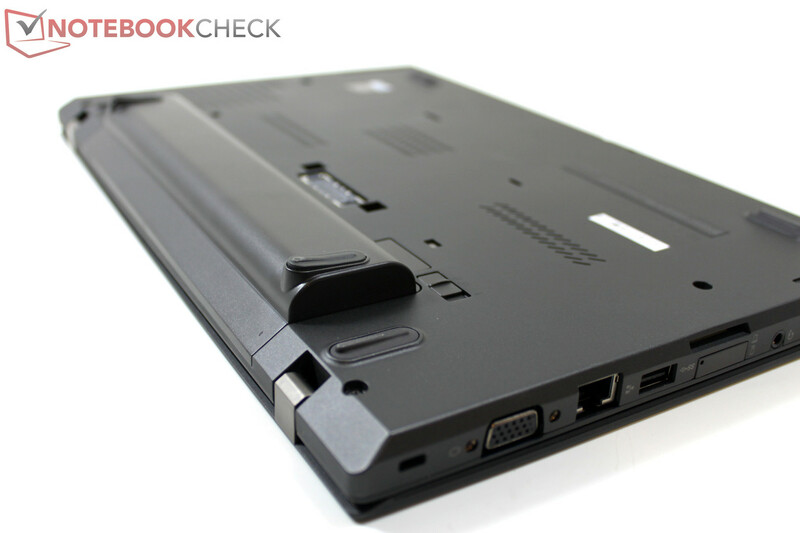 It has an integrated 24 Wh battery and a bulky 72 Wh battery pack attached to the back end of the notebook. The battery's capacity alone is enough for us to expect almost double the battery life. The optional 6-cell battery pack weighs about 300 grams (~0.66 lbs) -- around 180 grams (~0.4 lbs) more than the thinner 3-cell version that fits in the slot. The big battery also clearly juts out from the case and sets the notebook at a bit of an angle. If you use the notebook on a desk, this does not present a problem. 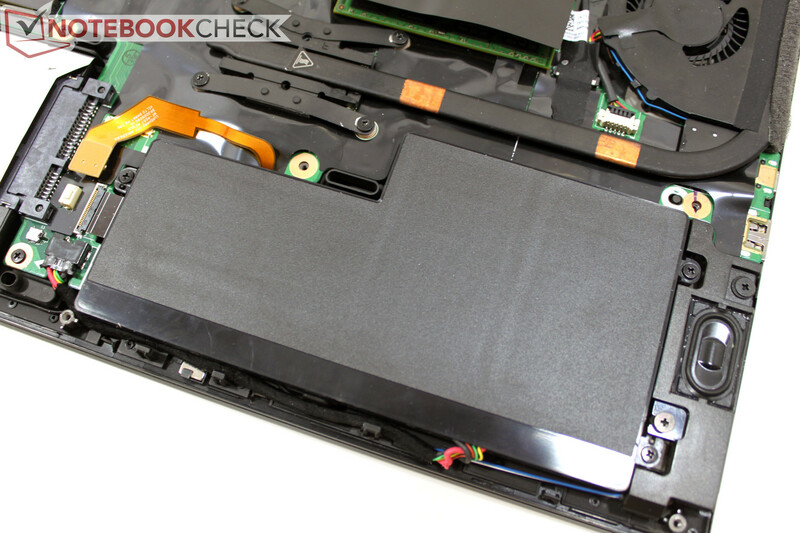 However, when it comes to lap use, we found the battery's bulge somewhat uncomfortable, especially its outer edges. One advantage of the dual battery solution: Without restarting the system and while programs are still running, you can switch out the battery. It would be reasonable to simply keep an additional battery on hand for when you need extra mobility. The notebook draws its power from the removable battery's reserves first, and its reserves are also the first to be replenished when the device is connected to a power socket. What does the bulky battery have to offer? In our WLAN surf test, which is designed to simulate everyday use (brightness set to about 150 cd/m², a new webpage loaded automatically every 40 seconds), the notebook provided us with 12.5 hours of mobile computing. That is in fact more than double the run time of the basic battery configuration (two 3-cell batteries). In addition, the T440s' idle run time of up to 28 hours sets a new record, too. After the ThinkPad T440s' basic model did so well in our tests, and now that Lenovo made improvements in several of the areas we previously critiqued, we are not surprised that an indisputably first-class device now sits before us. The most important item here is the Full HD IPS display. A higher resolution, improved brightness and contrast, and more accurate color representation all speak in favor of the new panel. 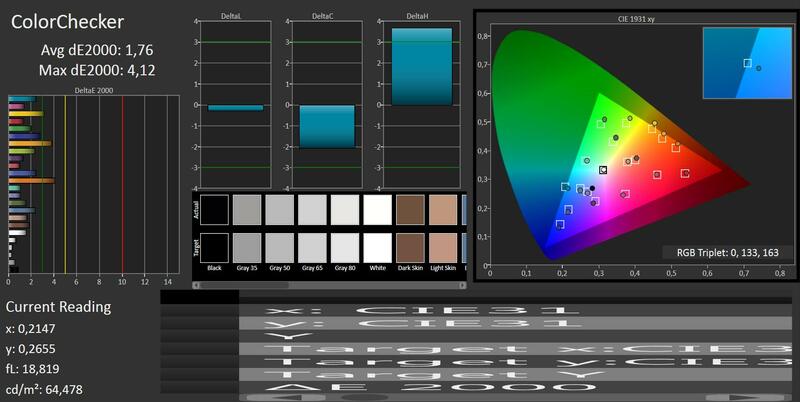 Additionally, if you are able to calibrate the display, you will be rewarded with outstanding color accuracy. In terms of performance, the SSD noticeably improves the system's overall speed. The quick program and system starts keep you from missing the extra capacity offered by a conventional HDD. Also, the i7 CPU proved to have an advantage over the alternative i5 CPU in our CPU and GPU benchmarks. Whether this is worth the cost increase, however, is up to the user. That will depend on the notebook's intended applications. Fortunately, the computer's increased performance does not come with increased emissions. The device remains comfortably cool and quiet under almost every level of load. Especially during normal office use, the SSD runs more quietly than the i5 version's HDD and transforms the notebook into an almost silent device. If the 6 hours of battery life for practical tasks (like surfing the web) are not enough, you can choose to purchase a 72 Wh battery pack. Compared to the basic battery configuration (two 24 Wh batteries), the one 24 Wh battery plus the 72 Wh battery pack provide double the web-surfing time. The price is a bulge on the underside of the device and about 180 grams (~0.4 lbs) extra weight. For about 1800 Euros (~$2435), Lenovo is offering a mobile device for the office that satisfies almost every possible desire. The only point of criticism we have to offer concerns the 5-key ClickPad. It takes over the function of the touchpad very well, but it takes some getting used to, and due to the lack of mechanical keys, it puts TrackPoint users at somewhat of a disadvantage. 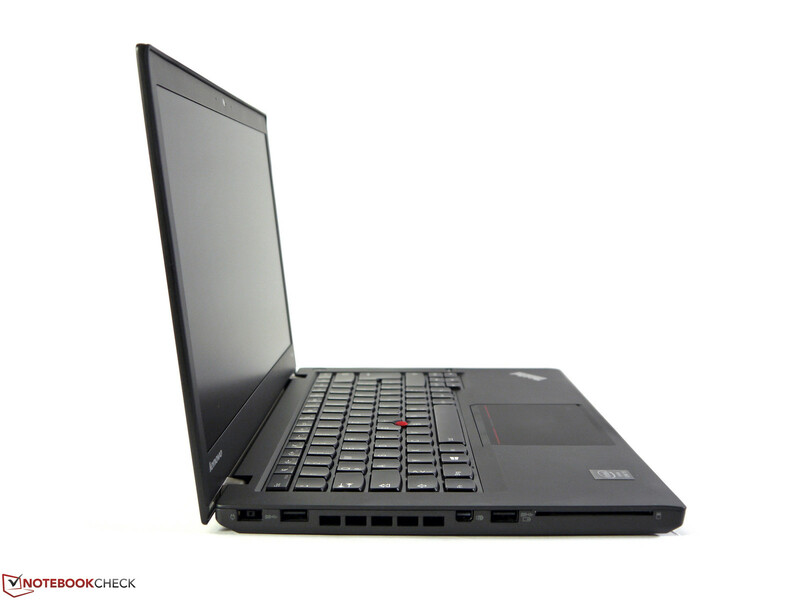 This high-end version of the ThinkPad T440s has everything a mobile workhorse ought to have. The free-standing TrackPoint keys from the predecessor series. As tempting as the 6-cell battery sounds on paper, once you have docked it to the device, it starts to lose its appeal. HP Elitebook 840, Dell Latitude E7440, and possibly the new Lenovo X1 Carbon.